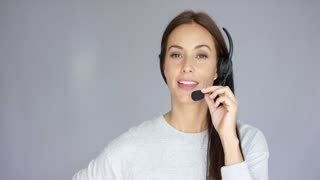 Adorable and beautiful female call center agent speaking with someone on headset. She has smile on her face. Isolated on gray. Beautiful and positive female call center agent at work. She speaking with customer using headset. Smiling. Isolated on gray background.